Welcome to Stricker Auto Repair! We are located at 421 Hanley Industrial Ct in Brentwood, MO. Open weekdays 8am-5pm except for major holidays. We have been repairing vehicles and making our customers happy for over 50 years! 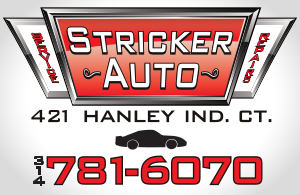 Stop by today to see what we are all about at Stricker Auto Repair. We guarantee that you will not be disappointed.